Thursday, my first full day back at the CPT office, I attended a funeral mass. The deceased had been shot two days earlier as he slept in his hammock outside his small house in Villa Dignidad. He was part of an estimated 200 families that had invaded a vacant piece of land over the last four months. It is located on the outskirts of Barrancabermeja and just 10 minutes by taxi from our CPT office. Since mid December the landowner had been threatening evictions and tension was rising. It is not clear who committed the murder. Later that afternoon we were told by another human rights organization that some kind of agreement had been reached to allow an orderly relocation of the families. We were called early Friday morning to come to the community the following morning. Apparently an agreement had not been reached. We arrived to find the entrance roads guarded and the perimeter surrounded by over a hundred members of the national police in full riot gear. A large contingent of the community was meeting in the center of a main street. We were there to help to keep things from getting out of hand. Many of you know that my youngest son, Kellen, has had some experience living in abandoned buildings over the last few years. I understand how that works, doing it one house at a time. I am still baffled as to how this group of folks got onto the land in the first place. It sounds like there may have been as many as 50 families that moved there in late September. These are extremely poor people who are out of work and can’t pay rent. We would call them homeless, except that these very poor folks with virtually no formal training had organized a leadership council, made a plan, and moved in. By January, as many as 50 of the total families would fit Colombia’s definition of “displaced” by the internal conflict, and that’s where this is such a complicated situation. 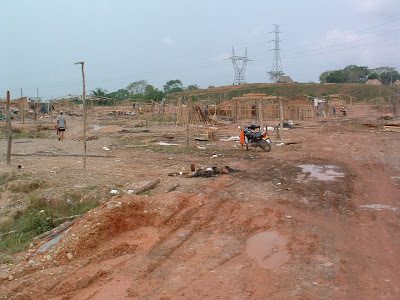 Yes, the families have trespassed and have no legal right to build homes in Villa Dignidad. 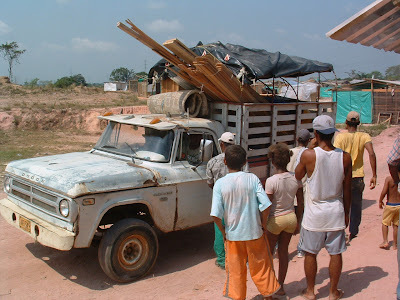 On the other hand, Colombian law requires that displaced persons be provided with a living space. 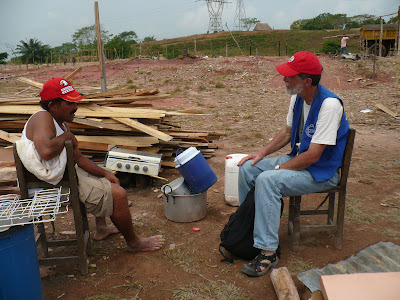 One official I talked to estimated that in Barrancabermeja alone there are 700 displaced families. Friday was long day. The temperature was in the high 90s. About half of the families had packed up or started to dismantle their houses by noon. The city was sending large trucks to help people collect and move the belongings, including most of the house. 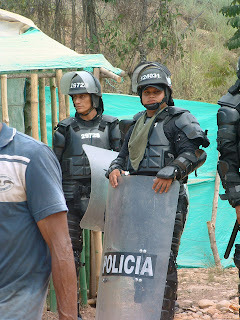 After several failed negotiations, and a show of force by the police, most of the others began to tear their houses down. Not all though. We talked with some who said, “Tell us where we are supposed to go. 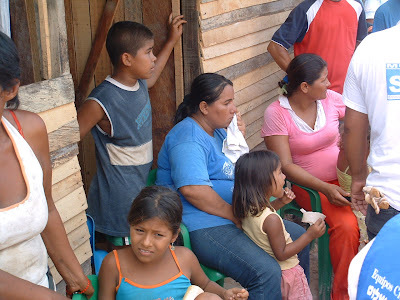 We have children, and we don’t know anyone here in Barranca. Where are we supposed to take these few things we own?” This is one of the tougher parts of being a CPTer. We can hopefully point those people to other organizations that are working on those issues, but we don’t provide direct aid. We left about 5:30 when things appeared to have calmed down. The police had moved back to their earlier positions and were promising not to act as long as people were leaving voluntarily. Saturday morning Sandra and I returned to see how things had progressed. Ninety percent of the people had left. 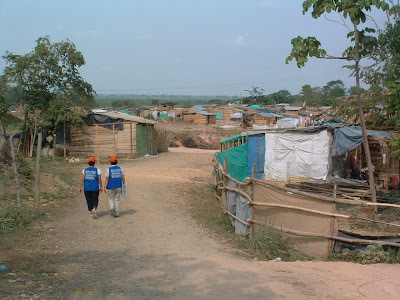 A significant group of displaced persons remained, and two women from social organizations who work with displaced persons were trying to sort things out for them. We walked around the loop we had walked the day before. My impression was that a huge storm had gone through. Maybe it had. A government sponsored storm.